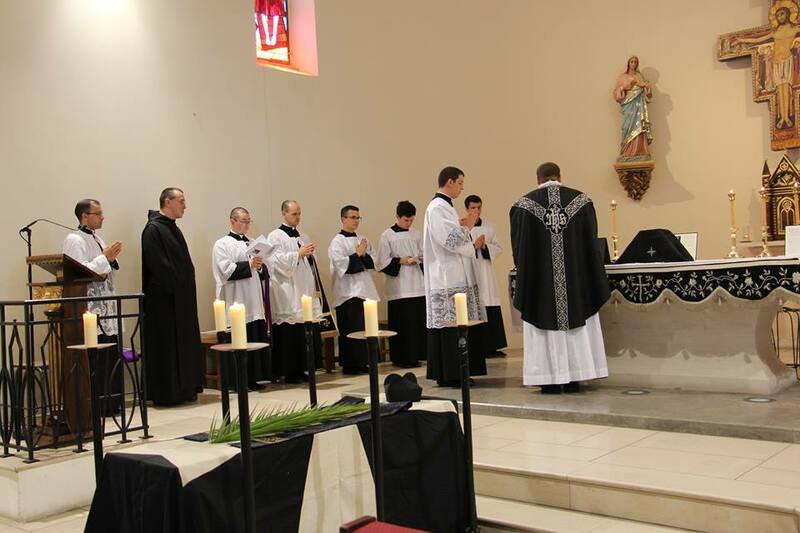 Yesterday, the Fraternity of St Joseph the Guardian celebrated a Requiem Mass for Fr Jacques Hamel in their church in La-Londe-Les-Maures, France. 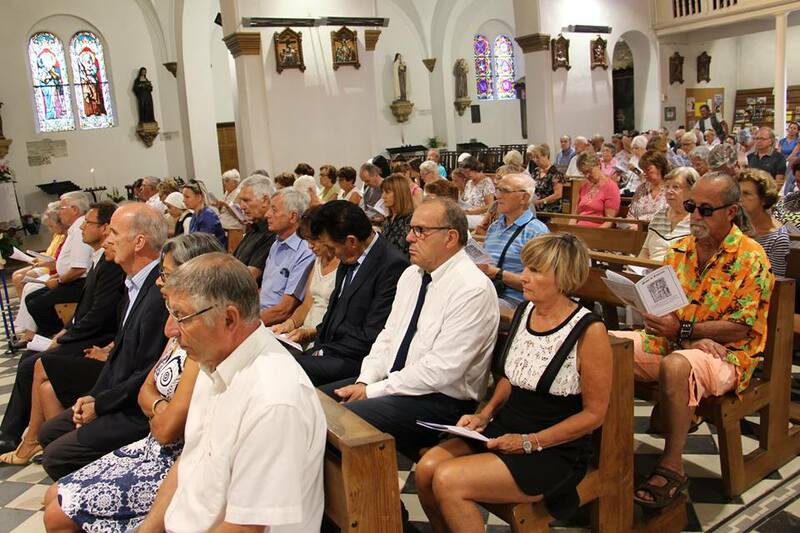 I am sure all our readers know that Fr Hamel, an 85-year-old priest, was murdered last Tuesday by Islamic fanatics while he was in the middle of celebrating Mass in a small church near Rouen. 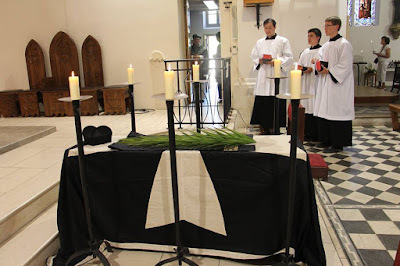 I would call to our readers’ attention the palm branch laid upon the catafalque, symbolizing that Fr Hamel was murdered in odium fidei, and may very well soon be formally honored by the Church as a martyr. The full set of pictures may be seen at the FSJC’s Facebook page. This story from the Golden Legend was included in the Roman Breviary even so late as 1529, in one of the last editions before the Tridientine reform. All trace of it was removed in the revision of Pope St Pius V, but it survives to this day in the folk traditions of southern France. 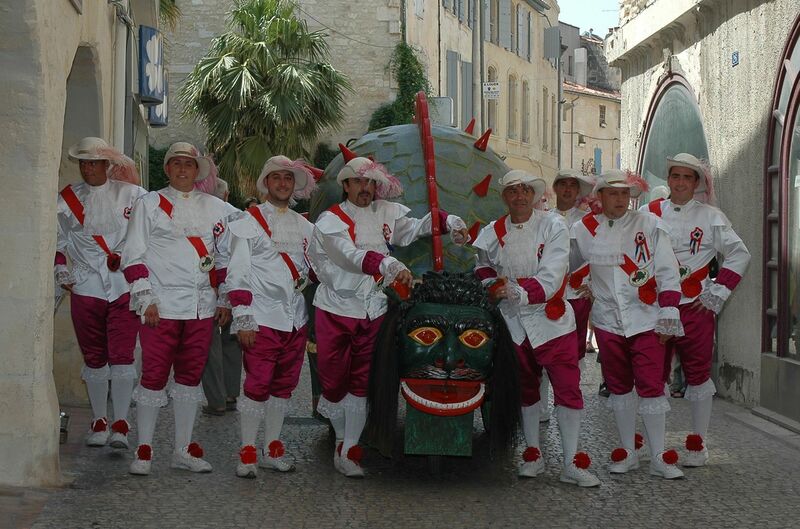 The monster, also called “Tarasque” in French, appears on the shield of the city of Tarascon, where the legend is commemorated in a folk festival held every year, and an effigy of the creature is carried through the city in a parade. 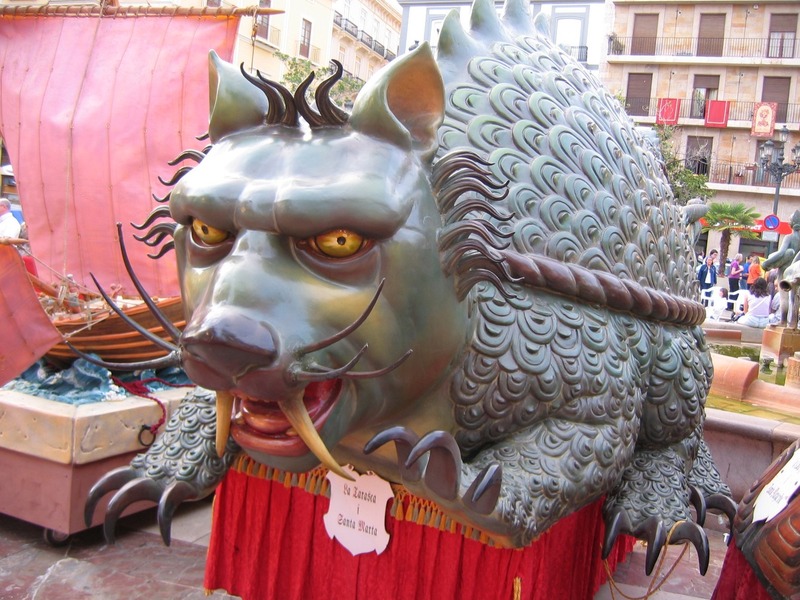 He also appears in some of the Corpus Christi festivals in Spain, as seen here in Valencia. 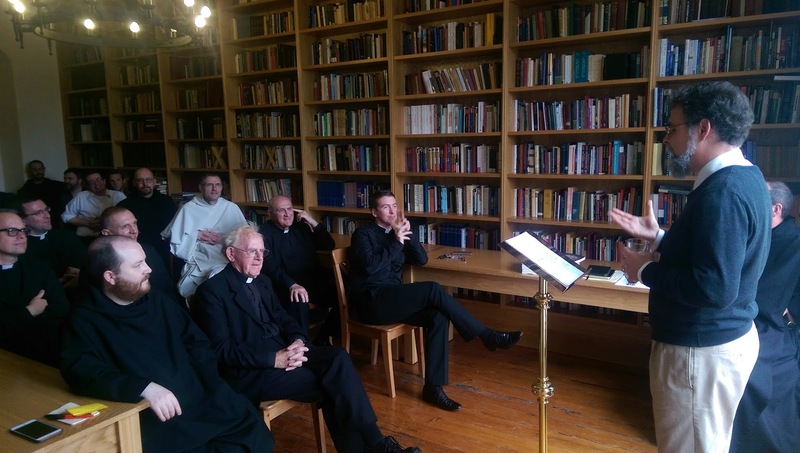 This week my family and I have been visiting Silverstream Priory in Ireland for a time of rest and prayer. At the invitation of the prior, Dom Mark Kirby, I gave a conference to monks, clergy, and seminarians this afternoon, the full text of which is available at Rorate; the audio has also been posted by the monks. When, and to the extent that, we act as if we were ordering God to ourselves instead [of ordering ourselves to God], He will allow us to suffer the just penalties of restlessness, boredom, dryness, disbelief, and even despair. 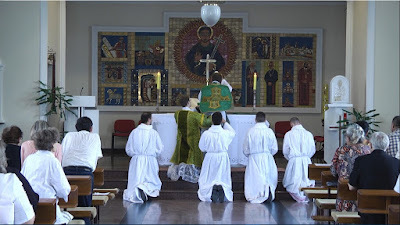 Nor should we underestimate the perceptiveness of the faithful in the pews, many of whom can readily sense the difference between a liturgy that is done for God’s sake, with His honor and glory as the motivating force, and a liturgy that is designed and conducted for the people, so as to involve, stimulate, affirm, entertain, or otherwise engage them. Later, I intend to share some photos and impressions of my time at Silverstream. It is a wonderful place, well worth the inquiries of young men who are serious about the Benedictine monastic life, or simply of a visit to share in their richly Eucharistic and Marian liturgical life. 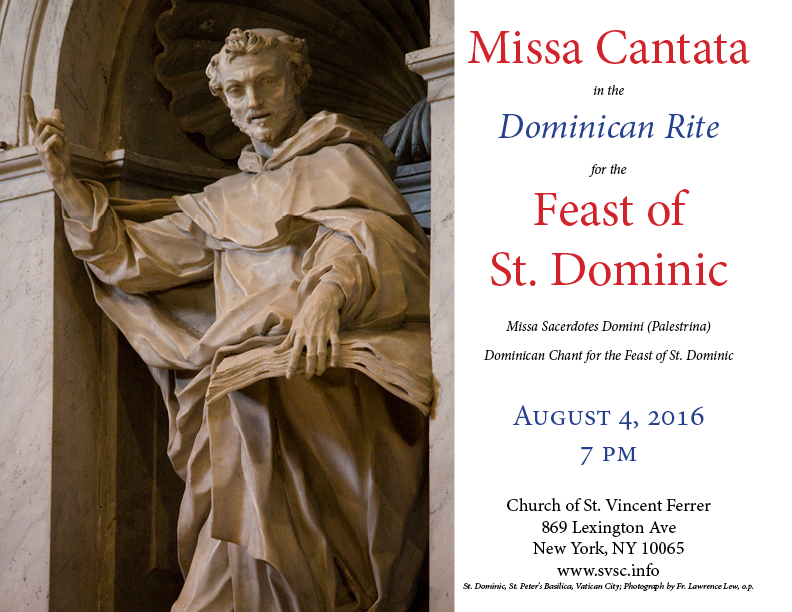 The Parish of St. Vincent Ferrer and St. Catherine of Siena in New York City will have a Missa Cantata for the Feast of St. Dominic (EF calendar) on August 4, 2016 at 7 pm. 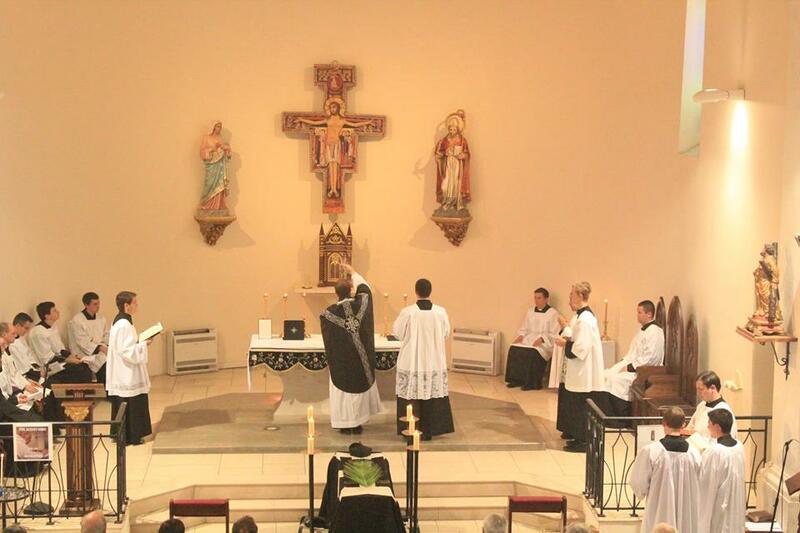 The Missa Sacerdotes Domini by Palestrina and Dominican Chant for the Feast of St. Dominic will be sung. All are welcome to celebrate the patronal feast of the Order of Friars Preachers during this 800th Anniversary of their foundation. The church of St. Vincent Ferrer is located at 869 Lexington Avenue. 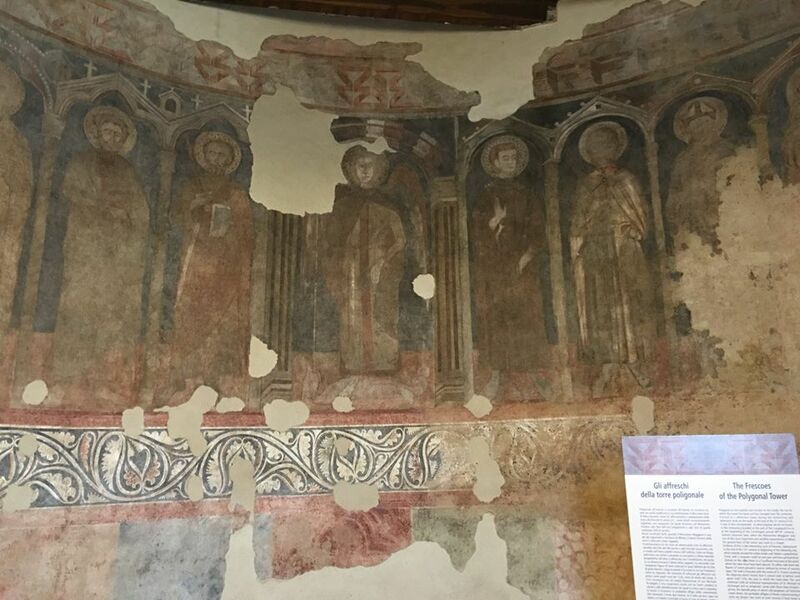 We have written about the Greater Monastery of Milan a few times recently, often referred to as the Sistine Chapel of Milan, since the comprehensive restoration, completed just over a year ago, of its 16th century church. 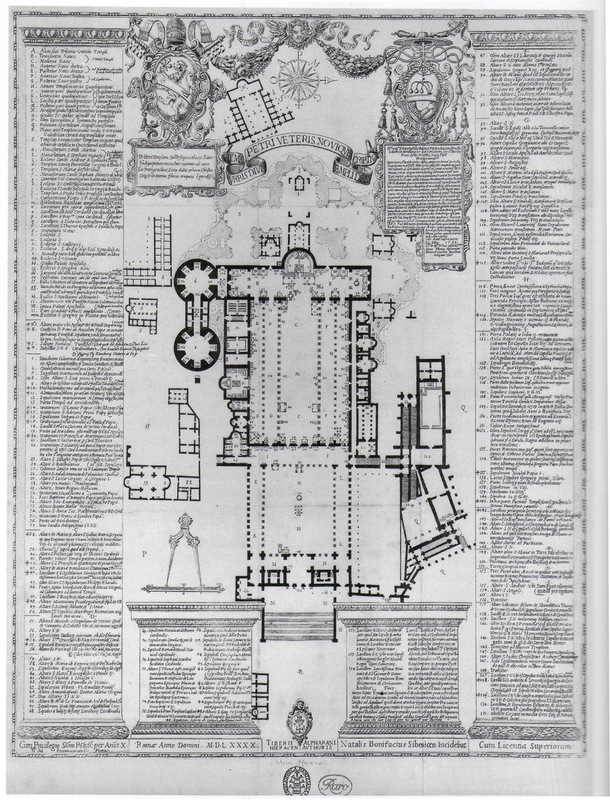 The monastery as a foundation was far older than the church, however, going back to the Carolingian era, and partly incorporating structures which were even older. 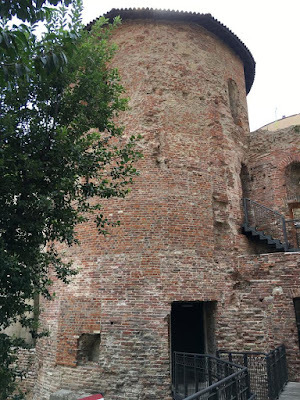 One of these is a tower which was originally part of the walls built around Milan in the very late 3rd or very early 4th century by the Emperor Maximilian. 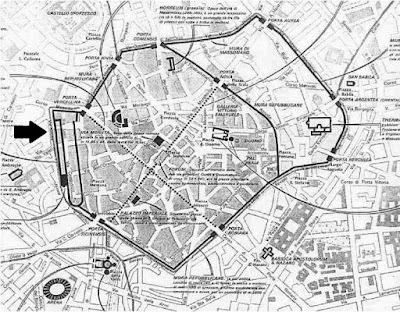 The tower was on the western side of the ancient city walls, part of the section that included the city’s charity racing circus, and very close to the imperial palace. 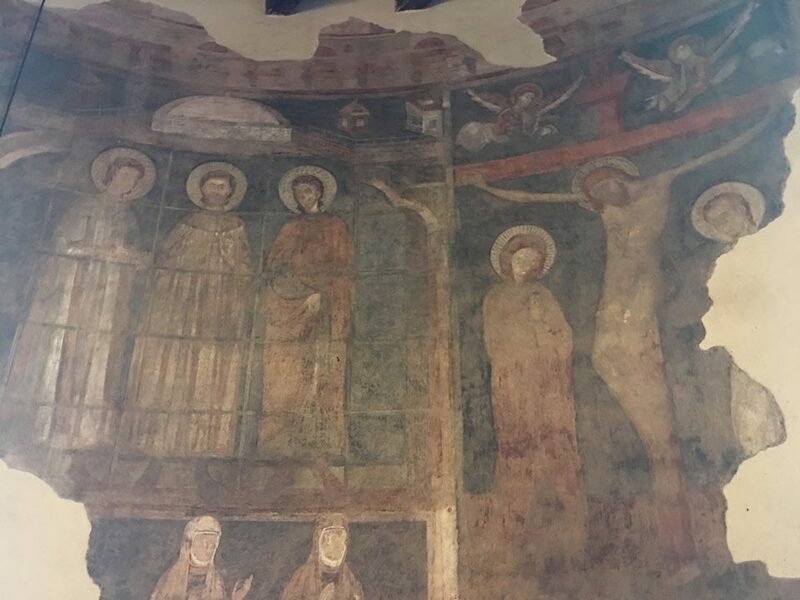 The interior of the tower was transformed into a chapel in the Middle Ages; the frescoes preserved therein today are from the 14th century. 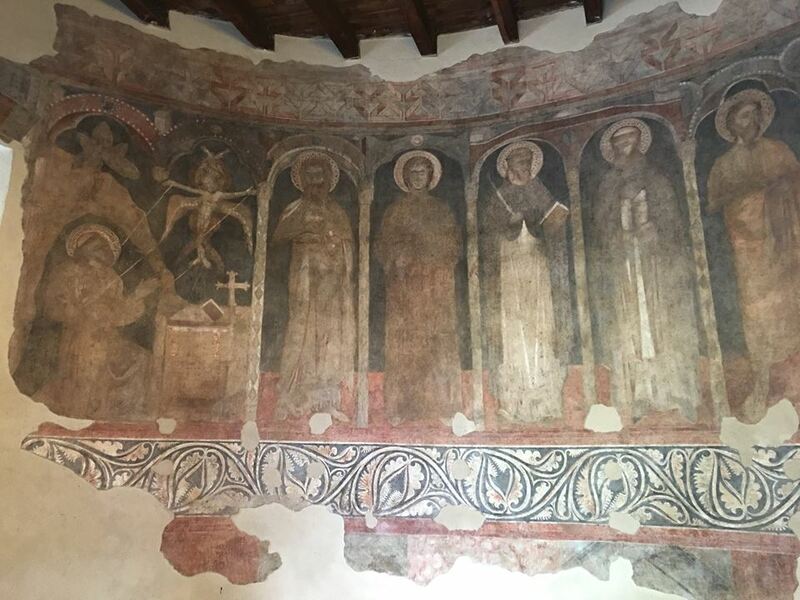 These photos come to us, of course, from our Milanese and Ambrosian Rite correspondent, Nicola de’ Grandi. The tower built ca. 300 A.D.
On the left, St Francis receives the stigmata; the identification of the other Saints is not altogether clear, but the Dominican will certainly be Saint Peter the Martyr, whose relics are kept in Milan. A medieval document refers to an altar within the complex of the Greater Monastery dedicated to St Michael the Archangel, where Masses for the dead were celebrated, “since the Saints in the resurrection do not marry, nor are they given in marriage, but they will be like the angels in heaven.” The more elaborate decoration around St Michael indicates that this was likely the location of said altar. 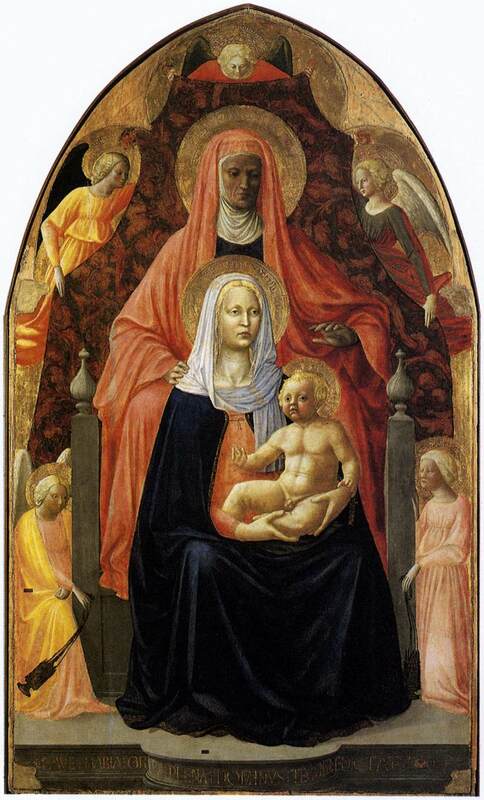 The identity of the three Saints shown here in prison is also disputed. They may be one of two groups of Milanese Saints either Vitalis and his sons Protasius and Gervasius, or Saints Victor, Nabor and Felix. They may also be Saint Maurice, to whom the church of monastery was dedicated, along with two other members of the Theban Legion, Ss Exsuperius and Candidus. 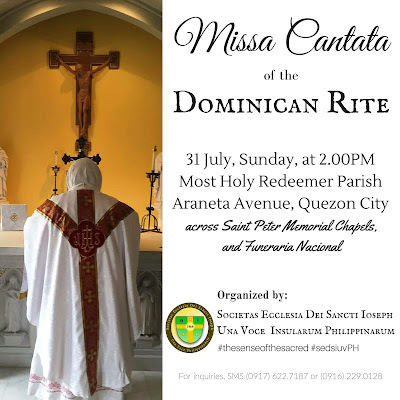 This coming Sunday, July 31st, the Parish of the Most Holy Redeemer Parish in Quezon City, The Philippines, will host our own Fr. 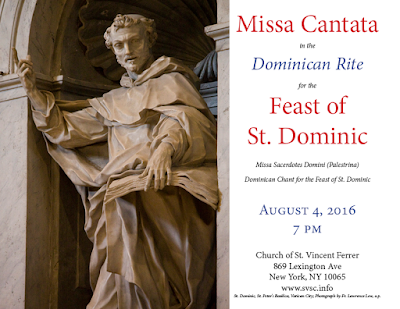 Lawrence Lew, O.P., for the celebration of a Missa Cantata in the Dominican Use, beginning at 2 p.m. 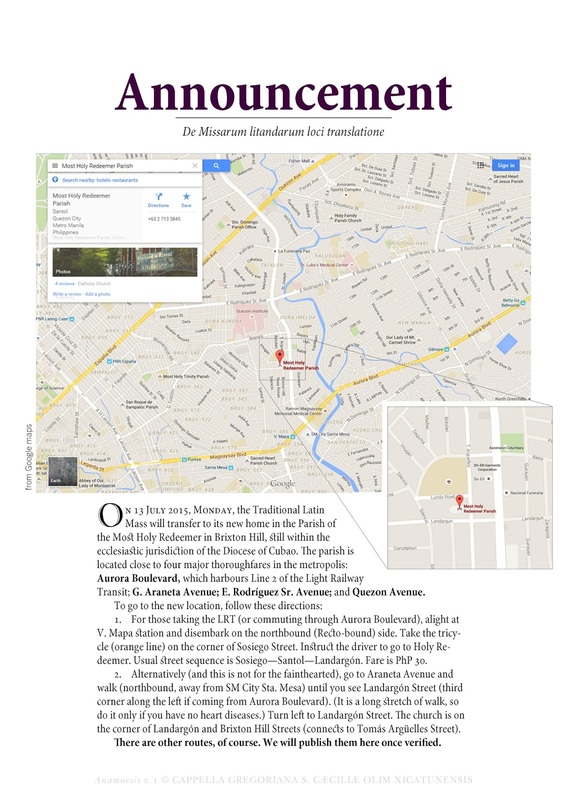 The organizers, the Societas Ecclesia Dei - Sancti Joseph, wish to express their gratitude to the curé of the parish, Rev. Fr. Michel Joe Zerrudo. 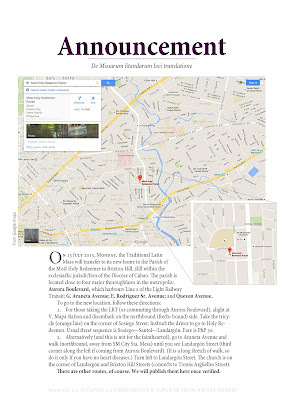 Click here to for the Facebook event page; directions to the church are given in the map below. 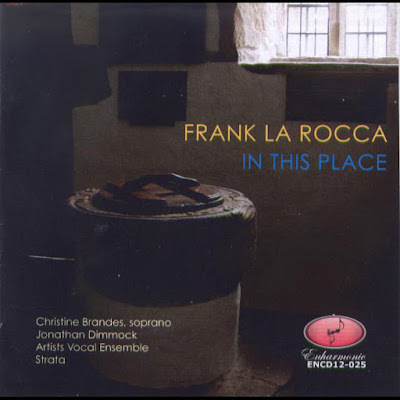 Here is a review of a selection of Frank La Rocca’s compositions called In This Place, written by Br Brad T. Elliot OP; it appeared first, in slightly altered form, on page 49 of the Fall 2015 edition of Sacred Music, the journal of the CMAA. 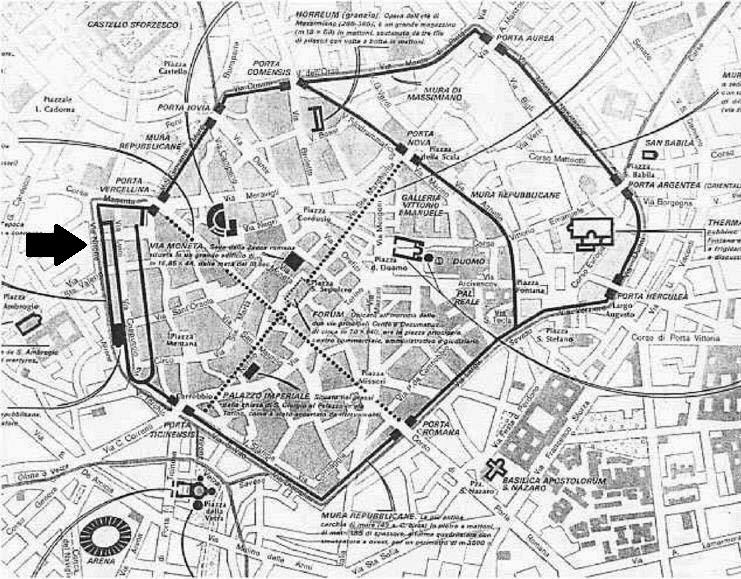 I have only just seen this, but I thought to bring it to your attention for a couple of reasons, the first being that I think that Frank La Rocca’s work deserves to get more attention. 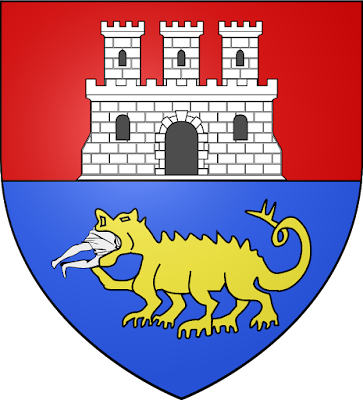 The second reason is that the principles by which the reviewer judges the merit of La Rocca’s works are themselves worthy of study. Br Brad Elliot, who is a Dominican of the Western Province of the United States, has a good grasp of music theory (way beyond my own) and of the principles of sacred music. He brings his knowledge of both into the discussion. As such, in this short piece, I feel he outlines succinctly a guide for patrons, composers, and for the judgment of such compositions, in accord with general principles are applicable in all the creative arts. Simply put, the giving over or tradere of the past into the future must pass through the present as a necessary middle term; the present is where the real tradition takes place. ...modern harmony should not be feared as a threat to sacred beauty. But he is quick to point out that such exploration can never be used as a reason for compromising the essential principles of sacred music. Is Frank La Rocca’s music doing this? Perhaps. I think so, and Br Brad thinks so. But we must be clear that fulfillment of the criteria that Br Brad lays down is not the only requirement. In the end, it has to appeal at a natural level to many people as well. This is the great challenge to the artist in any field, and the mark of true creativity. Neither Br Brad nor myself are the final arbiters of taste and so the final test of its goodness is not if he or I like it, but its popularity. If it is good, it will be performed, and congregations will be drawn to it. And only time can tell us this in regard to Frank La Rocca’s or any other composer’s music. You can decide for your self by listening to his work. 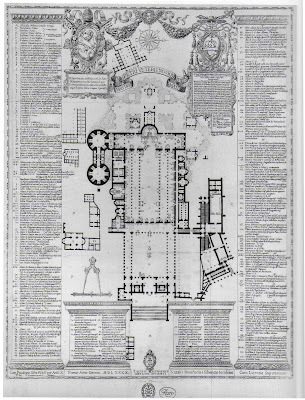 Here is his O Magnum Mysterium. We ought to encourage the continued creativity of people who understand the principles of sacred music and modern music, and are prepared to take that great risk in looking for ways of combining the two. Frank La Rocca looks to the incorporation of modern classical forms. This is not the only area of modern music in which people can look for inspiration, but whatever approach is taken, it has to be done with the dedication and respect for tradition with which we see from Frank and a few others. (Another example is my colleague on this blog, Peter Kwasniewski). The more people who are doing so, the more likely it is that the sacred musical form of today will break out of the esoteric circle of those who are deeply interested in such things and emerge as a new, popular and noble form. The music that does this will characterize our age when future generations look back at the early 21st century. Someone once tried to persuade me that I should appreciate the highly dissonant classical music of the 20th century with the absurd opening argument that “modern music isn’t as bad as it sounds.” While there is always a place for guiding people into an appreciation of what is good, if we have to persuade people that they ought to like something, we have failed. Composers of sacred music are in a precarious position in today’s world; in many ways, they are a dying breed. On the one hand, they find themselves competing with an aesthetic of the past, as so many in their audience are driven by a nostalgia for a form and harmony indicative of music centuries-old. On the other hand, they are immersed in a post-modern world that has all but forgotten the very natural laws of beauty, the very symmetry, proportion, and order imbued in creation that any authentic imitation of that creation – the ancient notion of art – should reflect. The contemporary composer of sacred music seems to be straddling two incommensurable worlds. How is he to be faithful to the tradition by assimilating its rich vocabulary, and yet express this vocabulary and pass it on to a post-modern world that has all but revolted against that language? The tension between purist and progressive is deeply felt by the sacred music composer. The Christian audience in today’s world inevitably defaults to equating a sacred aesthetic with an ancient or an old aesthetic, and this antiquity tends to become more and more idealized as it fades into a past known only through the frozen images of paintings or the archaic prose of worn books. 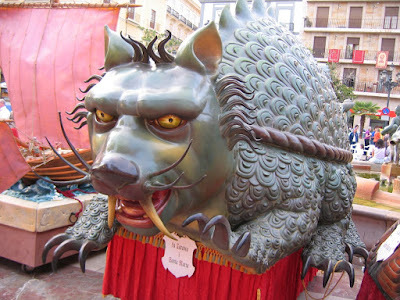 Yet if the tradition of sacred music is to be handed on at all, if it is to be a true tradition –tradere – or giving over of something, it cannot remain in the idealized past. After all, sacred music is not a mere platonic universal floating in a world of ideas; it must be instantiated in a present particular work, that is, a piece of music that contains all the individuality and unrepeatable character of any other. If the tradition of sacred music is to be known, it must be incarnated in the here-and-now, given flesh and matter through some distinct composition. Simply put, the giving over or tradere of the past into the future must pass through the present as a necessary middle term; the present is where the real tradition takes place. But here is precisely the dilemma; if any particular composition is to be a true giving over of something and not a mere replica of the past, than this work will naturally embody the character of the present time. The harmony, feel, texture, and aesthetic of the contemporary world will serve as the matter out of which the tradition again takes flesh. But can contemporary music actually provide a sufficient matter for a true expression of the sacred? Has the twentieth century, and now the twenty-first, provided a musical language with which the tradition can again be spoken? Or would not modern harmony, with its dissonance and atonality, compromise the sacred to an unrecognizable degree? Unfortunately, many answer this last question with a simple “yes.” This is the nature of the tension that composers know all too well. For the past twenty years I have been a lover of sacred music, both its history and contemporary trends, and I have grown accustomed to this tension. I confess that, for much of my life I would have, like the many mentioned above, simply denied that the modern aesthetic could ever express the transcendence which is the hallmark of sacred music. As easy as it may be to succumb to this doubt given the pervasive banality of so much contemporary music, every so often a composer emerges who provides the needed exception to this presumed distrust, a composer who fully embraces contemporary forms of structure and harmony and yet still remains rooted in the sacred tradition. The composer Frank La Rocca has again provided this welcomed exception and the album In This Place is proof that an artist fully immersed in twentieth-century music can again speak the language of the sacred musical tradition to contemporary ears in a way that is understandable and attractive. The album In This Place is unquestionably a work born from Catholic Christian spirituality with six of the eight compositions as settings of biblical or liturgical texts. From the opening, O Magnum Mysterium, a setting of the responsorial chant of Matins of Christmas, to the closing Credo, a setting of the Latin text of the Nicene Creed, the album is an explicit expression, in music, of the faith of the historic Christian Church. There is Expectavi Dominum with text from Psalm 40, Miserere with text of King David’s great prayer of repentance in Psalm 51, the Pentecost Sequence Veni Sancte Spiritus, and the famous prayer of St. Thomas Aquinas, O Sacrum Convivium. In addition to these vocal works, there is a piano work entitled Meditation, and an instrumental chamber work, In This Place, from which the album gets its name. The entire album is a kaleidoscope of colors, textures, and moods where, like the psalms and liturgical prayers themselves, the full spectrum of human emotion is embraced and felt. La Rocca is undoubtedly adept at composing with the dissonance and set-harmony of twentieth-century music fully playing with all its qualities, and yet the album touches tonal harmony at every turn. As one listens from start to finish, the composer takes the listener on a journey through both the traditional narrative-like tension/release of tonal harmony and the persistent chromatics of the modern era. In a sense, La Rocca pulls the best from both worlds and weaves them together into his own distinctive voice. While the influence of Renaissance composers like Orlande de Lassus and William Byrd may be heard, particularly in the choral works, the influence of twentieth-century composers is evident. One can hear the harmonic sharpness and rhythmic agility of Stravinsky as well as the mystical naturalism of Mahler. Far from being a patch-like jumble of the old and the new, it is an authentic blending in the truest sense of the word. Any lover of twentieth-century music will find in La Rocca a composer who fully understands his taste. Nonetheless, through these works, the lover of traditional sacred music will also hear, echoing as from the past into the present, a true icon of holy transcendence once again instantiated in the present. Similarly, the title track of the album, In This Place is also composed in the Aeolian mode. The composition, a solely instrumental work, is passionately mournful with an interplay between reed and string that is eerily prayer-like. La Rocca creates this mood, not only through harmonic dissonance, but also through taking advantage of the biting tambour of string and reed. There is a deep introspective element to the work reminiscent of the art songs of Mahler. The Credo is, as one might expect, most reflective of traditional forms. The influence of Gregorian chant can be heard in the opening phrase yet the music quickly expands to the use of counterpoint indicative of Renaissance polyphony. It is an experiment in the balance and contrast that may be achieved when music suitable for liturgy is combined with more modern concert forms. The settings of the psalms, Expectavi Dominum and Miserere, likewise harken back to an earlier polyphonic style but utilize modern harmonic colors to punctuate the biblical text. For example, Expectavi Dominum, the text of Psalm 40 which begins “I waited patiently for the Lord,” highlights the ache of this waiting by opening with the unconventional dissonance of a minor second. Miserere is, like the text of Psalm 51 itself, a musical journey from the bitterness of contrition, through the pain of repentance, and finally to the tranquility that accompanies faith in the Lord’s mercy. The music first expresses, through minor modes and dissonance, the sadness and gravity of King David’s confrontation with the horror of his own sin. But then as the text “cor mundum crea in me, Deus” is sung (create in me a clean heart O God), the music transforms into a joyful, restful praise of God. Following the biblical text, the music begins with mourning and anguish but ends in a musical Sabbath-rest. A particularly noteworthy piece is the sixth track on the album, O Sacrum Convivium. This is a setting of the prayer composed by St. Thomas Aquinas in praise of the Holy Eucharist and, like the rest of the album, it is a hauntingly beautiful blend of classic and contemporary elements. The work most reveals the influence that English Renaissance polyphony, particularly that of William Byrd, has had on La Rocca’s choral style. Of all the compositions, it contains the most triadic harmony and best represents traditional polyphonic structure. A classical yet unexpected opening occurs when the bass, tenor, alto, and soprano each respectively state the opening melody in ascending sequence. However, these ascending statements are not removed by a perfect fifth as one would traditionally expect, rather, they are each removed by a perfect fourth giving the opening a suspended and otherworldly feel most fitting for the text of the prayer. The polyphonic chant is interrupted by a recurring motif, arresting of the attention with its dense chromatic clusters, that emphasizes the theologically rich texts “in quo Christus sumitur” (in which Christ is received) and “mens impletur gratia” (the mind is filled with grace). The album as a whole is a courageous blend of styles and genres that is atypical for the fractioned world of modern music. Thus, it bears a confidence that is only born of years of artistic maturity. The sheer variety of the album pays testament to the diversity of influences that have shaped the composer’s ear and, what is more, pays greater testament to a composer who has himself wrestled with the interplay between these influences and has emerged from the battle. All lovers of sacred music wearied by the divide between the traditional and modern aesthetic will find happy repose in the album In This Place. Its varied collection hints that La Rocca has gone before us through this divide and is now giving to others the fruits of his own musical and spiritual journey. Indeed, modern harmony should not be feared as a threat to sacred beauty. In This Place is proof of this. For sacred beauty, like God Himself, is timeless; no age can claim Him as its own. Beauty, wherever it is found, may be used as an icon of God’s holy presence, and the composer Frank La Rocca has again given the world a fresh example of this truth. The album In This Place, far from being a mere restatement of the old, is a new instantiation of the tradition of sacred music in our own time. Far from re-creating the past, La Rocca speaks the tradition with his own musical voice. I encourage all lovers of music to invest time in listening to his work. It is time well spent. We are pleased to share with our readers this guest article by Veronica Arntz, a recent graduate of Wyoming Catholic College who will begin graduate studies in theology this fall at the Augustine Institute. 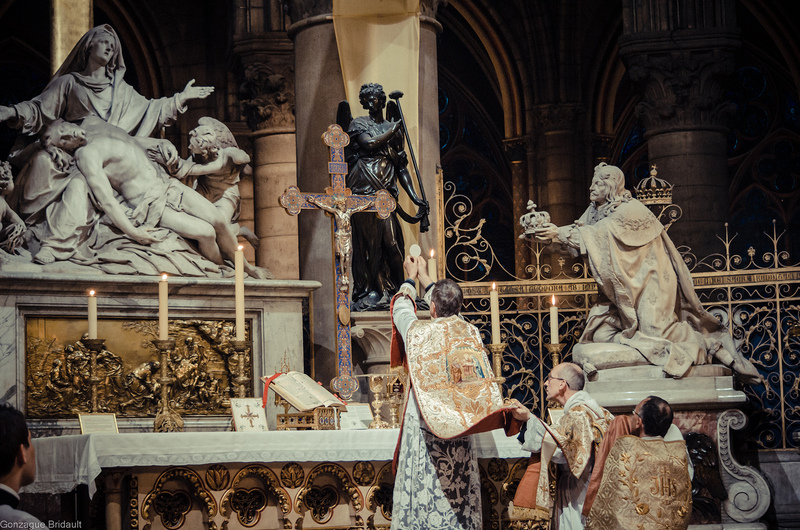 The heated debate surrounding Cardinal Robert Sarah’s call to celebrate the liturgy ad orientem shows deep division within the Church. If the liturgy is the “source and summit of the whole Christian life,” as Lumen gentium 11 proclaims, then it is essential for Catholics to celebrate it in unity of heart and mind. If we wish to accomplish anything within the fields of social justice, morality, and catechesis, we must approach the liturgy as a gift from God and as an organic whole, meant to unify the universal Church, not divide her. The question of ad orientem worship is extremely important for this unity of the Church and cannot be dismissed lightly. It is necessary, therefore, to understand how the external aspects of the liturgy are important to its celebration, for they assist in forming how we know, love, and serve God. In particular, our memories, as defined by St. Thomas Aquinas and St. Augustine, are formed and shaped by the externals of the liturgy, which means that we cannot ignore them or disregard them as unimportant. When St. Thomas Aquinas is discussing whether memory is part of prudence in the Summa Theologiae, he lists four ways by which man perfects his memory. The first of these, which shall be our focus, is the following: “When a man wishes to remember a thing, he should take some suitable yet somewhat unwonted illustration of it, since the unwonted strikes us more, and so makes a greater and stronger impression on the mind.” Aquinas gives the following reason for why we need illustrations: “Simple and spiritual impressions easily slip from the mind, unless they be tied as it were to some corporeal image, because human knowledge has a greater hold on sensible objects.” (II-II Q. 49, art. 1, ad 1) In other words, a man’s mind works best by connecting spiritual or invisible realities to a sensible image, for sensible realities are more knowable by him. When he tries to understand a spiritual reality, therefore, it is more likely to remain in his memory if he connects it with a sensible reality. In Book 10 of The Confessions, St. Augustine gives us an interesting perspective on how our memories are connected with God. 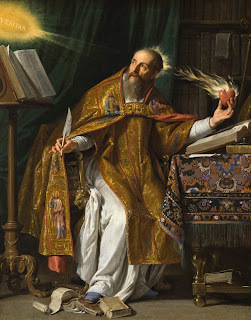 Augustine is in awe over the immense power of his memory: “Great is this power of memory, exceedingly great, O my God, a spreading limitless room within me. Who can reach its uttermost depth? Yet it is a faculty of my soul and belongs to my nature. In fact I cannot totally grasp all that I am.” We here find testimony to the fact that this faculty of his human nature, which exists in time, is also something beyond him. Even within his own memory, he finds it impossible to grasp his identity and his role in the world. The crux of the treatise, however, occurs when he realizes that God is within his memory, which is why his memory is beyond himself. “See now how great a space I have covered in my memory, in search of Thee, O Lord; and I have not found Thee outside it…From the time I learned of Thee, Thou hast remained in my memory, and there do I find Thee, when I turn my mind to Thee and find delight in Thee.” Thus, even though his memory knows things within time, it is still capable of holding within itself God, who is outside of time. For Augustine, memory makes present the things of the past, for time is measured in his mind. How then can God come to be in his mind, if He is eternal and exists outside of time? As Augustine explains, “You are before all the past by the eminence of Your ever-present eternity: and You dominate all the future in as much as it is still to be: and once it has come it will be past: but ‘Thou art always the Selfsame, and Thy years shall not fail.’ ” Thus, it is because God is the “eternal Creator of minds” that he is able to dwell in the mind, and specifically, in the memory. Augustine believes that, given how much our memory is able to hold and understand, then so much more God’s memory, which holds all knowledge, because He is eternal. In The Spirit of the Liturgy, Pope Benedict XVI argues that time and eternity meet in the Incarnation and in the liturgy. He writes, “All time is God’s time. When the eternal Word assumed human existence at his Incarnation, he also assumed temporality. He drew time into the sphere of eternity. Christ is himself the bridge between time and eternity.” Thus, because the Word took flesh, God has a connection with man, and indeed, with his memory. 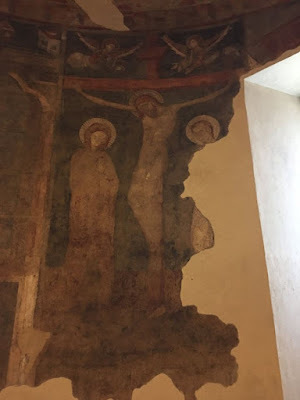 “In the Word incarnate, who remains man forever, the presence of eternity with time becomes bodily and concrete.” We thus see a connection to Aquinas’s remarks on memory. God, who is the most intelligible reality and thereby the most difficult for man to understand, took on human form, and now man has a concrete way to understand and know Him. Because Christ entered into time, He is likewise able to transform man’s memory, which exists in time, but is also beyond time, since it is ultimately united with God’s eternity. For Pope Benedict, liturgy is man’s window into Heaven, the place where heaven touches earth, and we are able to receive Christ daily in the Eucharist. 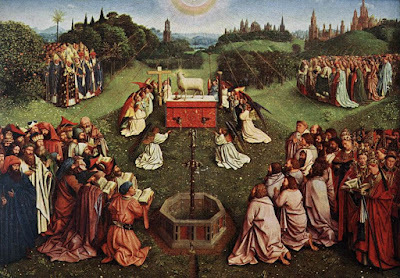 In the liturgy, man experiences the Beatific Vision for a brief moment of time while still on earth. 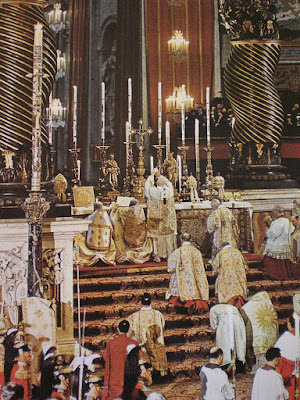 “The historical liturgy of Christendom is and always will be cosmic, without separation and without confusion, and only as such does it stand erect in its full grandeur.” Liturgy, although an action occurring within time, is ultimately cosmic, for it expands beyond the present time and points man toward his future life in Heaven. The cosmic time of the liturgy “becomes a representation of human time and of historical time, which moves toward the union of God and world, of history and universe, of matter and spirit—in a word, toward the New City whose light is God Himself.” This union of God and world achieved in the liturgy also occurs within the memory, which is an interior power of the soul. A man’s memory is united with the knowledge of eternity and God in the liturgy, and thereby becomes more like God’s own mind. Thus, the liturgy is not merely a spiritual reality; it is the place where God and man unite, which means that it is necessary to worship in a bodily way. 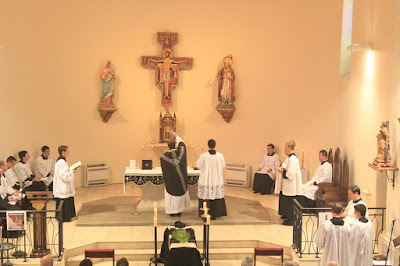 Furthermore, we cannot merely reduce liturgy to the structure of a meal, which many do when simplifying the essence of the liturgy to the Consecration of the Body and Blood, for this removes those externals that remind man of God’s presence in the liturgy. Because Christ’s presence is manifest in the liturgy, which occurs within man’s history, the externals of the liturgy are important for forming man’s memory. As we saw in Aquinas, the memory is formed through connections made between sensible and spiritual realities, which explain the rich external signs within the liturgy that help man become more united to God. The gestures of the priest, the beautiful vestments, the scent of incense, the detailed artwork, the ethereal music: all these external signs are meant to point to God. Moreover, because these signs are so intimately connected with the liturgy, they form man’s memory about the liturgy and about God. 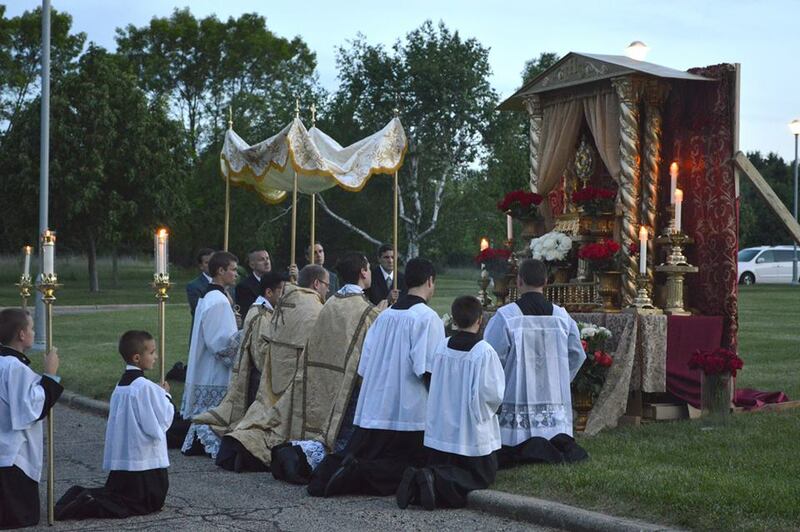 When a man remembers a beautifully celebrated Mass, he often remembers the corporeal signs he experienced, and we see this evident in the Pope-Emeritus’ memory of his Bavarian hometown celebration of Corpus Christi. “I can still smell those carpets of flowers and the freshness of the birch trees; I can see all the houses decorated, the banners, the singing; I can still hear the village band, which indeed sometimes dared more, on this occasion, than it was able!” All of the sights and smells of Corpus Christi are still deeply engraved within the memory; the liturgical life of the community created a beautiful memory for him, which he still connects with the glory of God. We are losing so much in our liturgical tradition with the loss of Corpus Christi celebrations; how many have such vivid memories of that feast? How many can say that Christ has entered deeply into their memories because of Corpus Christi processions and celebrations? This connection of memory and liturgy is one of the reasons that Cardinal Sarah is calling for liturgies to be celebrated ad orientem once again. 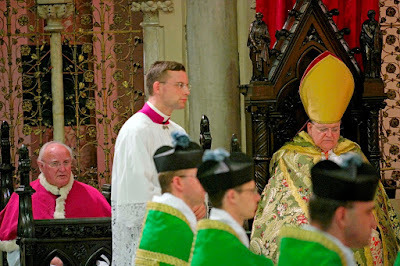 Since Vatican II, our memories of the liturgy have been shaped by the priest facing versus populum. 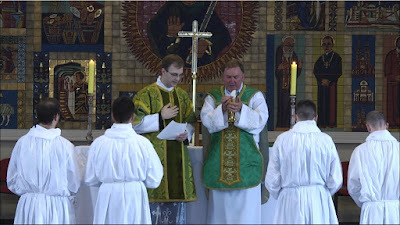 But, as Pope Benedict explains regarding this orientation, “The turning of the priest toward the people has turned the community into a self-enclosed circle.” Thus, our memories of the liturgy are not, generally, connected with God (as they should be), but rather, they are connected with a humanistic, self-centered sort of liturgy. We expect the priest to face us, so we can see him and understand his personality. We expect the priest to put on a show for us, so that we can be entertained for an hour and feel good about ourselves. The corporeal image we have connected with the liturgy in our mind is that of the priest himself. Our memories, however, have been trained with the wrong expectations. We ought to be turned together toward the Lord—our minds and our memories should be oriented toward God in the liturgy, for the liturgy is the anticipation of the coming Christ. 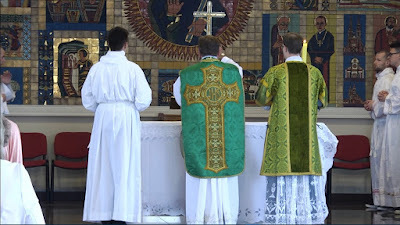 This is the purpose of the priest celebrating ad orientem: all who are part of the Mass, including the priest, are meant to be awaiting the Lord’s return. 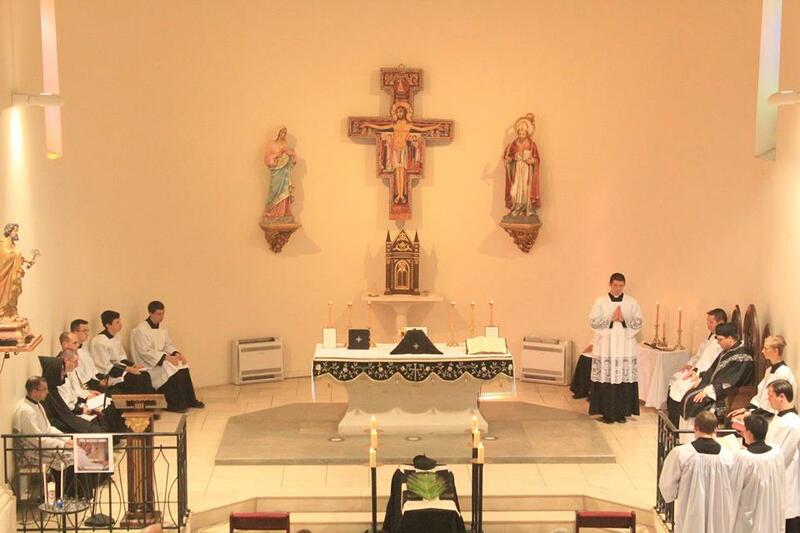 The sacrifice of the Mass is an offering to the Lord, not to the people. The cave said to be that of St Mary Magdalene, known in French as “La Sainte Baume”, is still a popular pilgrimage spot, in the charge of the Dominicans; I was able to visit it this May during the Fraternity of St Joseph the Guardian’s Pro Civitate Dei summer school in nearby La-Londe-les-Maures, certainly one of the highlights of the program. The entrance to the church complex. 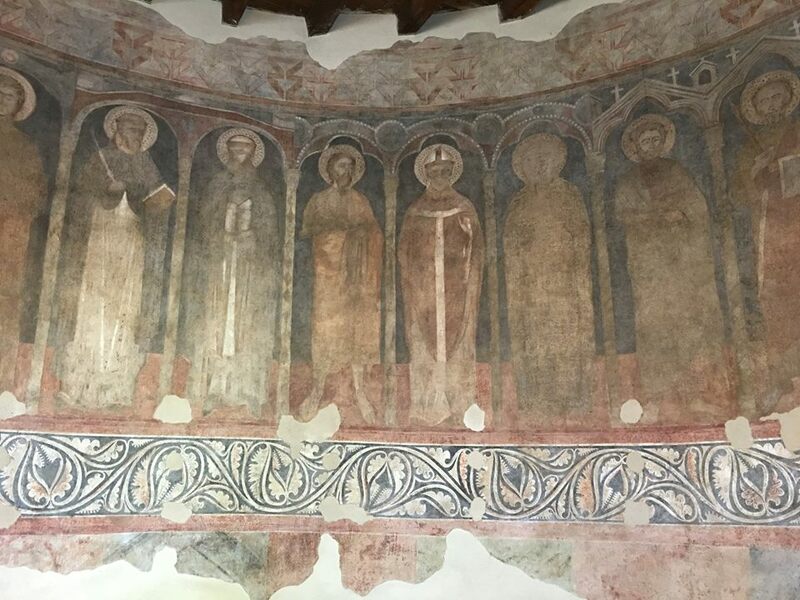 The cave, which is now a church, has been under the care of the Dominicans since 1295, with an interruption of over 40 years at the French Revolution. Before that, it was under Benedictines, and before them, “Cassianites,” i.e., monks who followed as their principal rule the writings of St John Cassian, who died at Marseilles in 435. A relic of St Magdalene now kept in the cave - her principal relics are at the church of St Maximin, which I wrote about on his feast day in June. A statue of St Mary Magdalene being rapt in ecstasy into heaven.